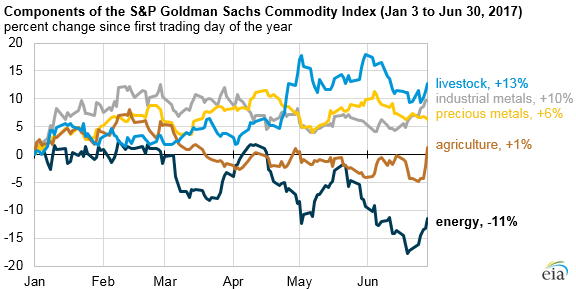 The energy component of the Standard and Poor’s Goldman Sachs Commodity Index (GSCI) fell 11% during the first half of 2017, the largest decline for any commodity group in the index. 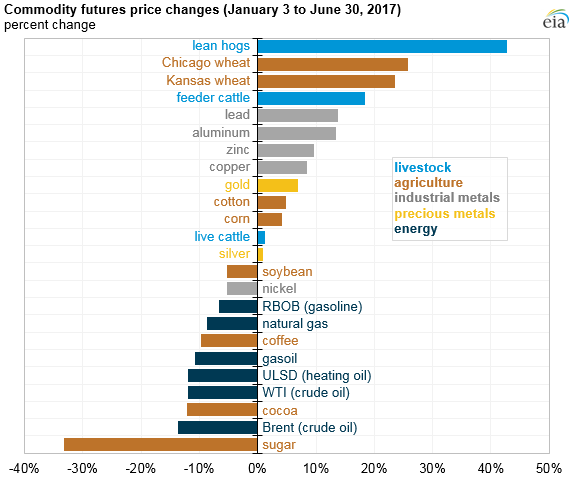 Other components of the index—livestock, industrial metals, precious metals, and agriculture—had end-of-June prices that were higher than at the beginning of the year. Supply-side developments unique to energy commodities likely contributed to the divergence. Note: RBOB is reformulated gasoline blendstock for oxygenate blending. ULSD is ultra-low sulfur diesel. WTI is West Texas Intermediate. Petroleum-based products such as reformulated gasoline blendstock for oxygenate blending (RBOB), ultra-low sulfur diesel (ULSD), and gasoil make up 24% of the S&P GSCI energy index. RBOB, essentially the petroleum-based component of motor gasoline, declined the least among petroleum products in the S&P GSCI energy index year to date, declining 7% through June 30. Gasoline prices exhibit seasonality and typically increase ahead of the summer driving season, which likely contributed to less of a decline in prices compared with crude oil and other petroleum products. Natural gas accounts for the remaining 6% of the S&P GSCI energy index. Natural gas prices declined the least among energy commodities, albeit with significant volatility throughout the first six months. Prices declined as much as 23% from the beginning of the year through mid-February ($3.33 per million British thermal units (MMBtu) to $2.56/MMBtu) because of a relatively warm winter in the United States. Natural gas prices then increased to $3.42/MMBtu in mid-May before falling to about $3.00/MMBtu by the end of June. Natural gas prices have largely been affected by increasing U.S. natural gas exports and relatively flat natural gas production.